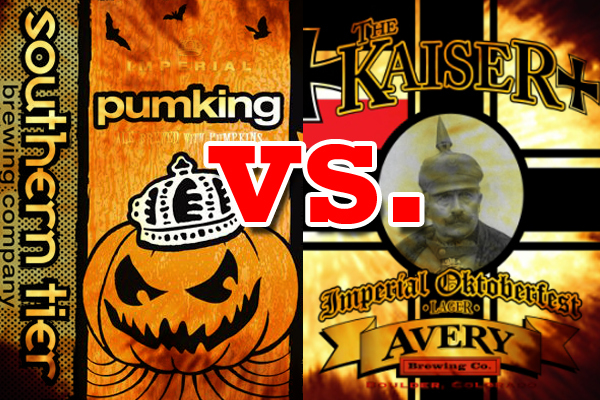 You are here: Home » The Kaiser Versus the King: Which is the Better Autumn Beer? 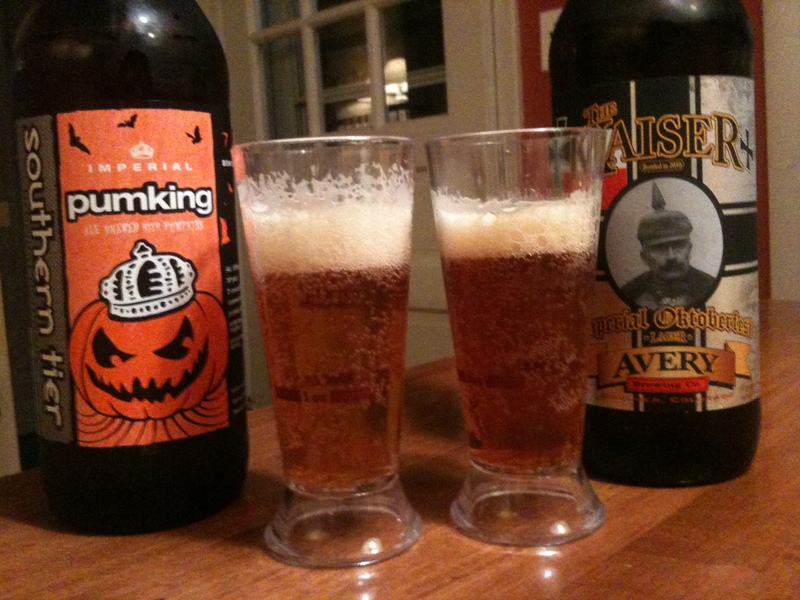 The Kaiser Versus the King: Which is the Better Autumn Beer? Unsatisfied with such an enlightened answer, I took matters into my own hands this weekend and did a Fall Beer Shootout, pitting Southern Tier’s Pumking against Avery’s Kaiser, an Imperial Oktoberfest Lager. I was determined to have my answer! The Contenders! And, yes, those are GABF tasting glasses. I figured going with an Imperial Oktoberfest gave the style a fighting chance, as I’m a fan of big flavors. And the Avery Kaiser was a great pick. It filled the glass with a beautiful amber hue, and filled the air with a sweet boozy caramel aroma. The first sip was pure pleasure, with an intense caramel goodness up front, a little sweet fruit in the middle (I often get pineapple from Avery beers for some reason) and then a warming boozy finish with a nice hop balance. I loved this beer – with an ABV of 10%, this is certainly my kind of Oktoberfest! The Southern Tier Pumking was next. I remember it as being one of my favorite pumpkin beers last year, as I am firmly in the “pumpkin pie in a glass” camp when it comes to the style. I don’t go for subtle, and the Pumking doesn’t disappoint. There’s a strong malty backbone that almost serves as the “crust” of the pie, a big gush of vanilla, a mild clove bite, some cinnamon, and a 9% ABV that provides a satisfying alcohol finish, letting you know this beer is a sipper, not a swigger. It’s a spicy treat that has everything I look for in a pumpkin beer. All things considered, I enjoyed the Kaiser much more, but I think the Pumking is the hands down winner here. Before you call me an idiot, let me explain. If this were a “best tasting beer” shootout, the Kaiser would win by a landslide. It’s a wonderful beer and I savored every sip. But this is a “best autumn beer” shootout, and the Pumking has one very powerful advantage: Flavor memory. You see, I’ve been eating pumpkin pie in the Fall since I was a little kid, and with it’s spices and sweetness, Pumking evokes all sorts of childhood memories of fallen leaves, warm sweaters, good times with friends and family, and many other things I associate with my favorite season. It immediately puts me in an autumnal state of mind. Having not grown up drinking Oktoberfest beers (parents can be such a buzzkill), brews like the Kaiser simply cannot compete with the Pumking and all of its pumpkin beer brethren. I know they are gimmick beers, but it’s a gimmick that works on me and scores the win here for the veggie beers. At the risk of further contradicting myself, Let me add that I probably won’t be buying Pumking or any other pumpkin beers again this season, but I will certainly be bringing home more of the Kaiser. Even though Pumking is probably my favorite pumpkin beer, I had trouble getting into it this year, especially drinking it side by side with a “real” beer as good as the Kaiser. I think I’m one-and-done with pumpkin brews this year. So to sum up, the Pumking wins, but Kaiser is the better beer, and even though the results here back up my previous statement that I would choose a pumpkin beer over an Oktoberfest when it comes to Fall beers, I am now going on record as saying I’d buy the Oktoberfest again and I’m done with pumpkin beers for the season. That sounds about right for me. These Fall beers are driving me nuts! Ha ha! Noted, Oliver. Thanks for the tip! Never had the Kaiser. Pumpkin is one of 3 pumpkin beers I actually like. But it’s still bested by Elysian Night Owl. I looked for the Elysian last week but didn’t see it. I’ll keep my eyes peeled, as you make it sound pretty tasty! Hoping the Avery Kaiser comes our way. We generally have an Avery selection, although not sure we always get everything. Planning on a week of pumpkin brew reviews once the weather cools off and feels fallish. If you got burnt out on one, I’m gonna be fried after a few days! Got a DFH punkin, the Southern Tier Pumking and an Elysian Night Owl should be on its way. Any other suggestions for my week of pumpkin brew reviews? Sounds like the right line up, Chad. DFH and Pumping are the two best I’ve had, and folks say good things about the Night Owl. I would recommend a coupe of others, but I imagine after three pumpkin beers, you’ll be ready to move on. I wasn’t a fan of either. But, I generally don’t like fall beers. In my world, Cinnamon and cloves belong nowhere near beer. Kaiser was a little too “much” for me. Too sweet, too boozy. Very nicely done. And it is called “Pumking”. Oops! Thanks for the heads-up, Mike. I’ve fixed it now. I guess I should RTFL. Jim, you should have gotten one of those Kaiser helmets for this review. Maybe stick a pumpkin atop the spike. Trying to find Night Owl myself. If you see it, let me know! Vice versa on the Night Owl Scott. If you see it let me know as well. And I hope that Pumking put a little hair on your chest (or other appropriate areas). just had the southern tier pumpkin. it is my new favorite pumpkin of the year! Anything in a big bottle from Southern Tier is my favorite.